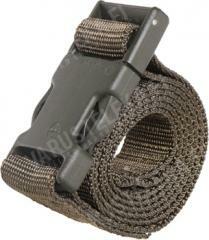 An excellent strap to attach things onto your equipment with. 21st century stuff, this comes with a plastic quick-release buckle! 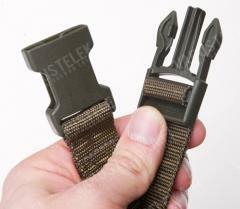 Width 25 mm, with the female buckle being about 32 mm wide at the widest part. Swiss military surplus, in really nice condition. Manufactured by ITW Nexus made in the USA, not really Swiss but still outstanding quality! I can´t get enough of these sturdy as hell and i use them for everything! Alittle on the short side but guess what just connect two together... Problem solved! Hyviä hihnoja. Takki kulkee mukana Särmä partiorepun pohjassa parilla tämmösellä nätisti! Really excellent quality. You can never have too many in my opinion.